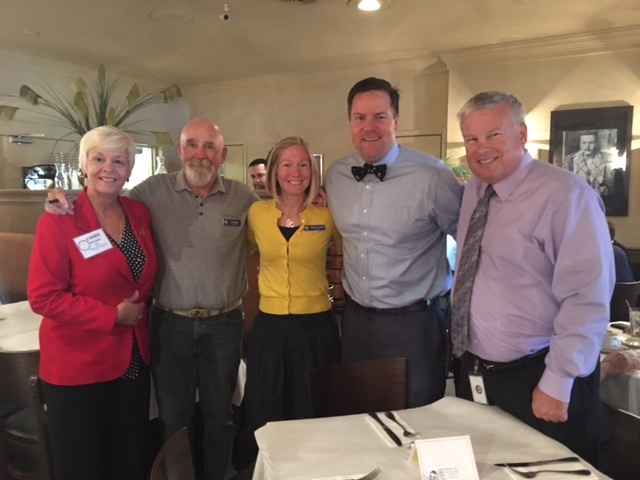 Senator Aaron Bean and representatives from the Fernandina Beach City Commission rocked the house at Ciao Italian Bistro on Thursday, October 27, as they kicked-off the Celebrity Waiters Luncheon to support The Arc Nassau. The team representing Fernandina Beach included Vice Mayor Robin Lentz, Commissioner Len Kreger and City Manager Dale Martin. Candy Holloway, executive director of The Arc Nassau, congratulated the team on an extraordinary effort in support of Ark’s mission. The Fernandina Beach team more than tripled the amount of donations they raised last year. The competition continued on Friday as Judge Robert Foster and Nassau County Commissioners Walter JR Boatright, Pat Edwards and George Spicer hosted the Luncheon to take on the challenge set the previous day by the Fernandina Beach team. Judge Foster and the Nassau County Team took the 2015 Top Tipper Trophy and set the bar high for this year’s challenge. President of The Arc Nassau, Hugh McLean, commended both teams for their good spirited work in this friendly rivalry. Proceeds from the Celebrity Waiters Luncheon make possible programs such as, the Unique Learning System, beneficial for everyone at any level; Assistive Technology, the opportunity for exploration and expression; and transportation, for community inclusion and employment services. Individuals from The Arc Nassau were on hand for the Luncheon on both days to thank patrons for their gifts. They also enjoy lunch provided by Kim and Luca Misciasci, proprietors of Ciao Italian Bistro and gracious hosts of Ark’s annual Celebrity Waiters Luncheon. Photo: L-R Candy Holloway, Com. Len Kreger, Vice Mayor Robin Lentz, Senator Aaron Bean, City Manager Dale Martin.